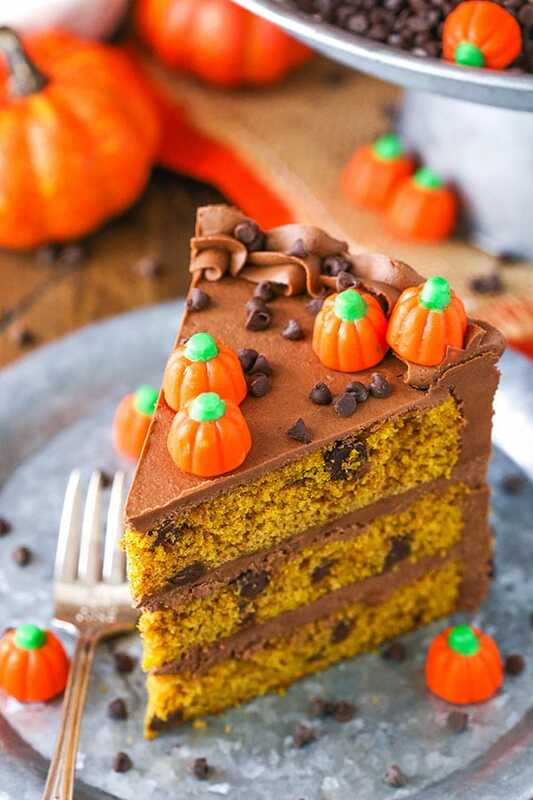 This Pumpkin Chocolate Chip Layer Cake is a tender, moist pumpkin cake with chocolate chips and a smooth chocolate frosting made with melted chocolate! 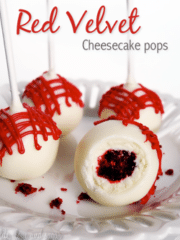 Perfect for fall and the holidays! So the boys turned 9 months this past weekend and it’s amazing to me how much they grow and change so quickly. And even after 9 months, it still occasionally hits me it a funny way that we actually have twins. Like, two babies at the same time. It makes me laugh sometimes to think about how crazy and unpredictable life can be. Never in a million years would I have guessed it and never would I ever change it. I was on my way home from the grocery store yesterday after getting a few ingredients and as I was driving towards our house, my mother-in-law, who helps with the boys so I can get work done, was pushing the boys in their side-by-side stroller on a walk. I couldn’t help but smile thinking about the two of them – TWO of them – and how they are literally growing up right next to each other all day every day. They interact with each other more and more and I hope they are the best of friends as they grow up. And speaking of walks with the boys, it’s getting cooler out so we are grasping onto to every slightly warm and not too cold day we can right now. We all love our walks and the winter is going to be so very sad. I’m already wondering if I can build them some big heated bubble we can walk in. But with the cooler weather also comes my very favorite time of year and I can’t wait to watch the boys experience it for the first time. Thanksgiving and Christmas = awesome family time, festive days and celebrations and allllll the good food. 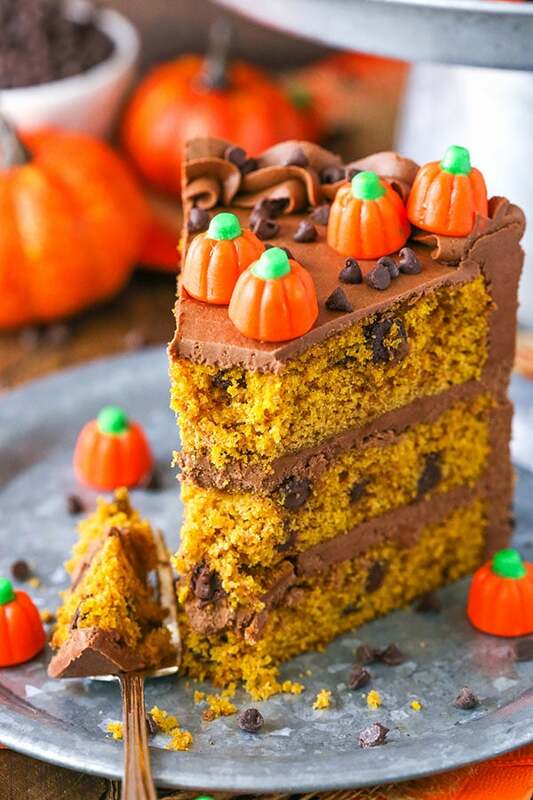 And this Pumpkin Chocolate Chip Layer Cake totally is part of that good food. Like seriously, so good. 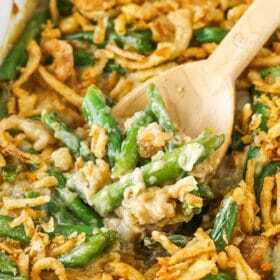 It’s moist and tender and full of pumpkin flavor and spice. 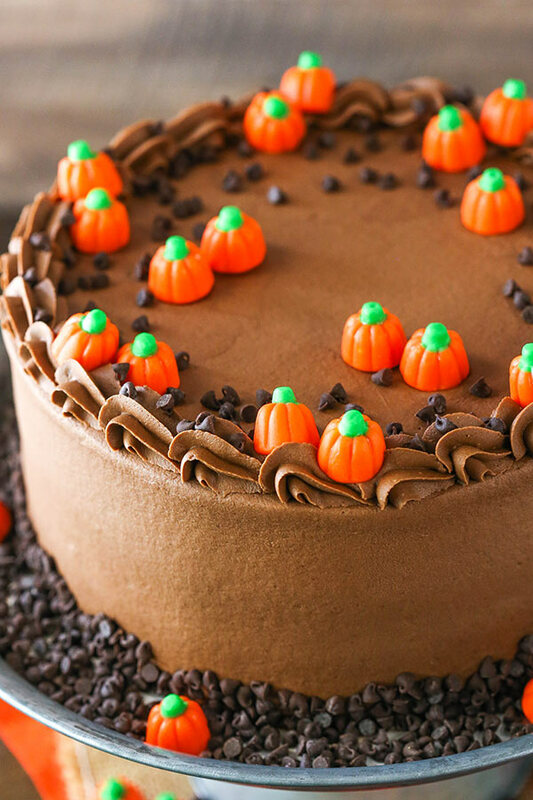 It’s studded with chocolate chips – just enough so that they’re clearly there without them taking over the pumpkin. The cake is layered and covered with one of my favorite chocolate frostings. 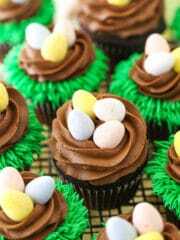 It’s made with real melted chocolate, so you get that great chocolate flavor that goes perfectly with the chocolate chips. 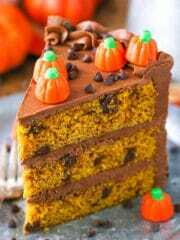 I’m always a fan of decorating my cakes with something that’s either used in the cake or indicates what the cake is, so this cake is finished off with mini chocolate chips and little pumpkin candies. Such a fun, festive decor and super simple, which is great since we are also getting into one of the busiest times of year. I suggest refrigerating the cake, since the frosting is a full-butter frosting, but I recommend serving the cake at room temperature. I find that cake flavor and texture are almost always better at room temperature. And with this cake, since the frosting is made with melted chocolate, it’s also a better consistency for cutting at room temperature. It’s fairly firm when cold. 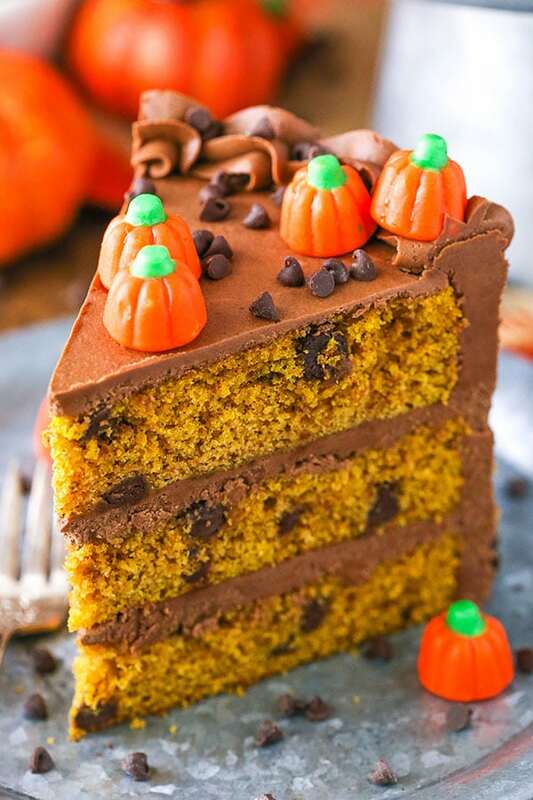 This Pumpkin Chocolate Chip Layer Cake is super tasty and totally addicting! 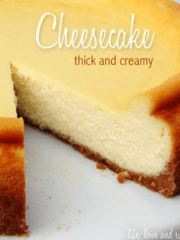 It’s also fairly simple to put together – for a layered cake. I hope you get a chance to try it! 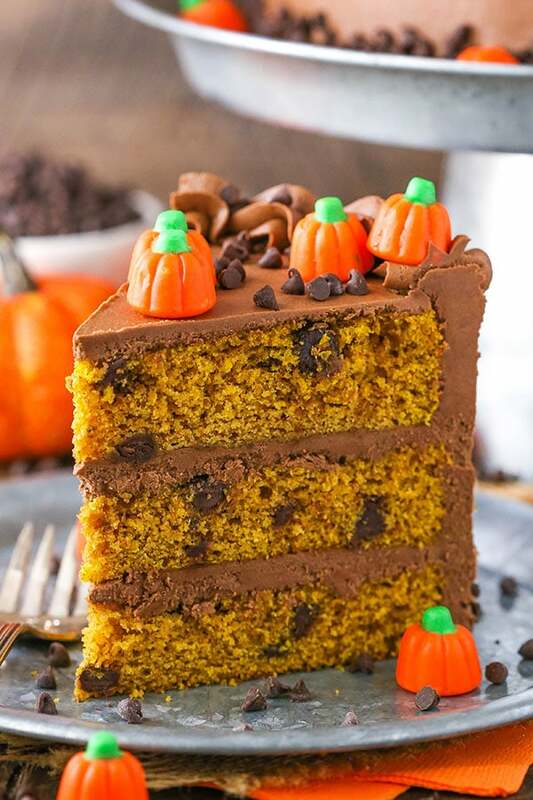 This Pumpkin Chocolate Chip Cake is a tender, moist pumpkin cake with chocolate chips and a silky smooth chocolate frosting made with melted chocolate! Perfect for fall and the holidays! 2. 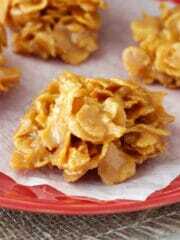 Combine the flour, baking powder, baking soda, spices and salt in a medium sized bowl and set aside. 6. Add the vanilla extract and pumpkin puree and mix until well combined. 9. 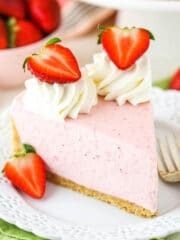 Divide the batter evenly between the prepared cake pans and bake for 24-27 minutes, or until a toothpick comes out with a few moist crumbs. 10. 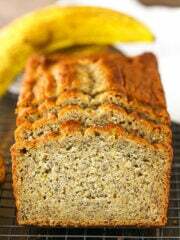 Remove cakes from oven and allow to cool for 2-3 minutes, then remove to a cooling rack to finish cooling. 11. To make the chocolate frosting, add the butter to a large mixer bowl and beat until smooth. 12. Add the melted chocolate and mix until well combined. 13. Add the cocoa powder and mix until well combined. 14. Add about half of the powdered sugar, salt and half of the heavy cream and mix until well combined. 15. Add the remaining powdered sugar and mix until smooth. 16. 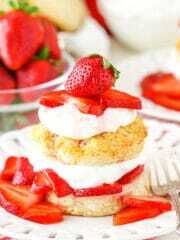 Add the remaining heavy cream as needed to get the right consistency of frosting. 17. To layer the cake, first use a large serrated knife to remove the domes from the tops of the cakes so they are flat. 18. 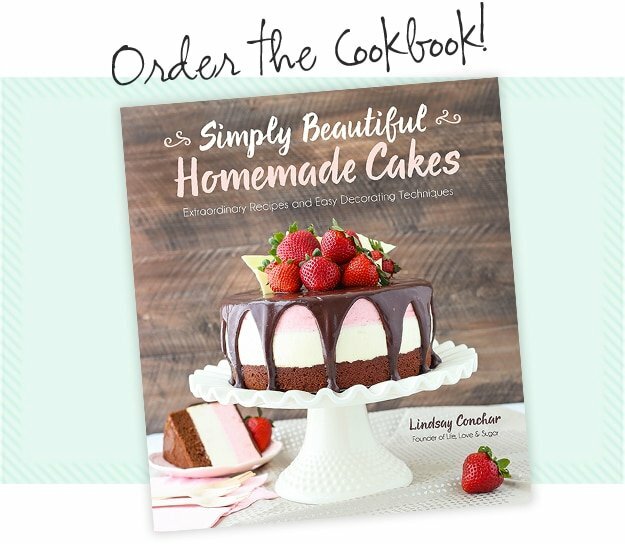 Place the first cake layer on a serving plate or on a cardboard cake circle. 19. Spread about 1 cup of frosting on top of the cake layer. 20. Add the second layer of cake and another cup of frosting. 21. Top the cake with the third layer and frost the top and outside of the cake with the remaining chocolate frosting. Refer to my tutorial for frosting a smooth cake, if you’d like. 22. Pipe shells onto the outside edge of the top of the cake. 23. Press some mini chocolate chips into the bottom edge of the cake. 24. 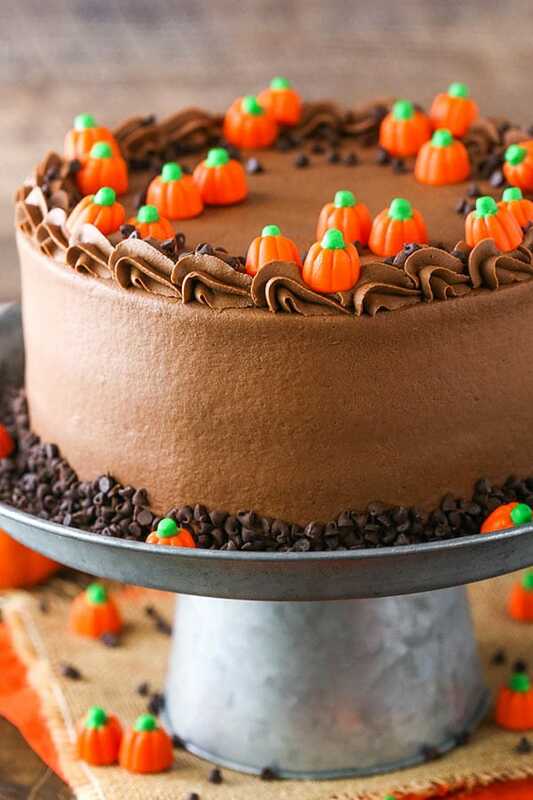 Place a few candy pumpkins around the top of the cake, then add a few more mini chocolate chips. 25. 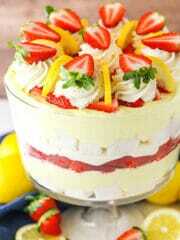 Refrigerate cake in an air tight container. Serve at room temperature. 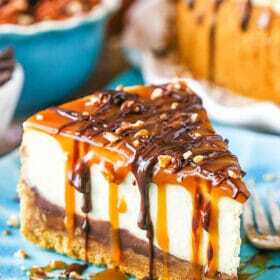 Cake is best if eaten within 2-3 days. Hi Lindsay! 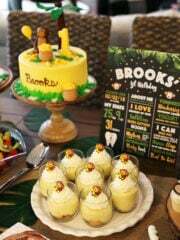 My family loved this cake, but I didn’t see in the instructions where to add the chocolate chips to the batter? I’m so glad you enjoyed it! The chocolate chips are added at the end of mixing the batter. I’ve updated the instructions. Thanks!